Paperback. Every fact, theory and myth behind the 1888 Whitechapel killings scrutinised, dissected and analysed by two of today's leading Ripperologists. In this comprehensive account of London's most infamous serial killer, the authors explore the facts behind the most grisly episode of the Victorian era: the violent slaughter of several prostitutes over a 3-month period. 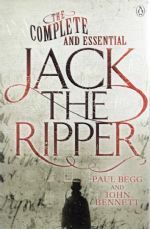 Setting the scene in the impoverished East End, their meticulous research offers detailed accounts of the lives of the Ripper's female victims and a thorough examination of the police investigation. It looks at the many suspects uncovered over the years and the way in which they have often mirrored contemporary concerns, and they examine the growth and development of the myth in film and literature. The definitive book, exploring both the myth and reality of Britain's most famous murderer and his victims. Part One : The Whitechapel Murders; Part Two : Theories; Part Three : Mythologies. Illus. + Afterword, Useful Resources, Notes and Index. 329pp. trade size softcover. Vg. with no creasing to covers.